Published: Mar 7, 2013 to ? Shy bookstore clerk Kosuke Mikado has the ability to see ghosts and spirits, an ability he wishes he didn't have, since what he sees usually terrifies him. Rihito Hiyakawa, an exorcist whose supernatural powers are as strong as his social graces are weak, doesn't seem to fear anything, mortal or otherwise. When this odd couple gets together to solve the bizarre cases that come their way, their work methods may not be entirely safe for work! 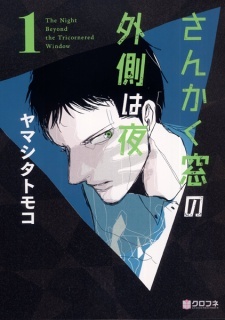 Sankaku Mado no Sotogawa wa Yoru has been published in English as The Night Beyond the Tricornered Window by Sublime Manga since March 24, 2015.